You have selected the Summer Season Club Membership membership level. 1.1. 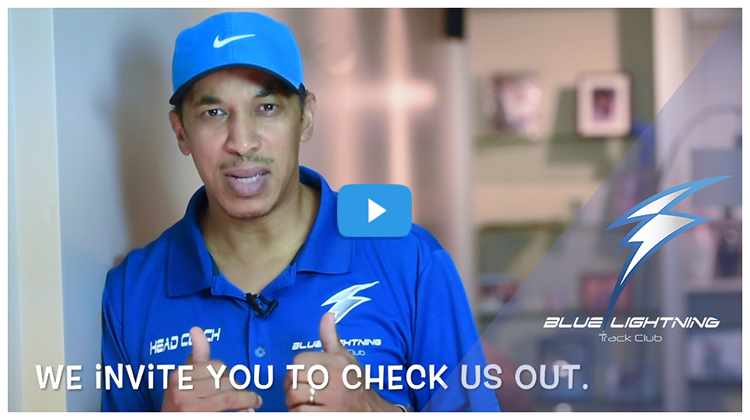 This Website (“www.bluelightningtrack.com”) is owned and operated by Blue Lightning Track Club (BLTC) whose registered office is at 2280 Wren Rd SE Conyers, GA 30094. 1.2 You are asked to read these terms and conditions of use (the “Terms and Conditions”) carefully. By accessing this Website and/or any pages thereof (hereinafter referred to as the "Website"), you signify your agreement with an understanding of the following Terms and Conditions and the legal information pertaining to both this Website and any material on it. If you do not agree to these Terms and Conditions, do not access this Website. In addition, when using particular services, you shall be subject to any posted guidelines or rules applicable to such services that may be posted on the Website from time to time. All such guidelines or rules are hereby incorporated by reference into these Terms and Conditions. To the extent that there is any inconsistency between the Terms and Conditions and any other terms of service, those other terms of service shall prevail in respect of the service concerned only. 1.3 These Terms & Conditions were last updated in October 2012. The BLTC reserves the right to change these Terms and Conditions at any time without notice to you. You are therefore responsible for regularly reviewing these Terms and Conditions. Continued use of this Website following any such changes shall constitute your acceptance of such changes. 1.4 For the purposes of these Terms and Conditions, “we", "our" and "us" refers to the BLTC while references to “you” and “your” refers to the persons accessing this Website (including persons who access this site on the behalf of other persons). The copyright and all other rights in the material on the Website are owned by the BLTC or are included with the permission of the owner of the rights. As a visitor to the Website, you may download a single copy of the material on the Website on a single computer for your own private viewing/listening purposes only. Single copies of pages from the Website may be printed out for the sole purposes of enabling the person printing the page to retain a copy for their own personal records. No copying or distribution of material on the Website for any commercial or business use is permitted without our prior written consent. No photography, filming, broadcast, alteration or modification of the pages of the Website is permitted without our prior written consent except as may be reasonably necessary to use the Website in good faith. 4.1.3. acknowledge that the BLTC may require you to confirm the above rights and warranties and agree to do so within 7 days of any request from the BLTC. 4.2. The BLTC reserves the right (but not the obligation) at its sole discretion to refuse, review, edit, move or remove any content that is posted to, or available on, the Website without the need to give any reasons for doing so. However, the BLTC will not review the materials that you or anyone else makes to the Website and therefore, unless we are specifically notified of the nature of any item of content, you cannot assume that the BLTC is aware of it. If you object to the publication of any material placed on the Website, please contact the BLTC using the contact us section of the website and we will take whatever action we deem appropriate. Copyright in any software that is made available for download from the Website and/or the BLTC Materials (as defined below) belongs to the BLTC or its suppliers. Your use of the software is governed by the terms of any license agreement that may accompany or be included with it. Do not install or use any software unless you agree to such license agreement. 6.1. You acknowledge and agree that the BLTC has no responsibility for the accuracy or availability of information, material or content provided by the third party linked websites, or the content, performance, terms, and conditions of use or the privacy policies or practices of such websites. Links to such sites do not constitute an endorsement by the BLTC of such websites or the content, products, or other materials or services presented on such websites. Information in the many web pages that are linked to the Website, and the applications and services available through the Website, comes from a variety of sources. The BLTC does not author, edit, or monitor the content, links, or services provided by third parties. THE BLTC SHALL NOT BE RESPONSIBLE OR LIABLE, DIRECTLY OR INDIRECTLY, FOR ANY DAMAGE OR LOSS CAUSED OR ALLEGED TO BE CAUSED BY OR IN CONNECTION WITH USE OF OR RELIANCE ON ANY SUCH CONTENT, PRODUCTS, OR OTHER MATERIAL AVAILABLE ON THE WEBSITE OR ON THIRD PARTY LINKED WEBSITES. 6.2.4 to ensure that the link does not state or imply that the BLTC sponsors or endorses any other website activity, company or entity, or presents the BLTC and/or the sport of Athletics in a false, misleading, defamatory or derogatory manner. 6.3 The link to our Website does not permit you to use any BLTC and/or third party content, names, logos, pictures or trademarks, unless separately agreed to in writing by the relevant rights-holder. All BLTC trademarks (whether registered or unregistered) and graphics, logos, designs, page headers and button icons are the intellectual property rights of the BLTC and neither they, nor any confusingly similar versions, may be used by you, including (but not limited to) as part of any trademarks and/or domain names without the prior written consent of the BLTC other than for the purpose of referring to the BLTC and its associated brands lawfully and in good faith (only). The BLTC cannot and will not be liable for any losses, damages or costs arising from your failure to comply with these requirements. 9.1. Whilst the BLTC endeavors to ensure that the Website is normally available 24 hours a day, due to the inherent nature of the Internet, errors, interruptions, and delays may occur in the service at any time. Accordingly, the Website is provided on an "AS IS" and "AS AVAILABLE" basis without any warranties of any kind and we do not accept any liability arising from any interruption in availability. Access to the Website may be suspended temporarily and without notice in the case of system failure, maintenance or repair or for any other reasonable cause. 9.2. You acknowledge that whilst the BLTC endeavors to ensure that information on the Website and any related material provided to you by the BLTC, whether by email or otherwise (the BLTC Materials”), is accurate and complete, it is provided only for general information, is not intended to address your particular requirements and does not constitute any form of advice or recommendation by the BLTC. You acknowledge that the information on the Website does not necessarily reflect the views and opinions of the BLTC or any of its brands and that the BLTC Materials should not be relied upon by you in making (or refraining from making) any specific investment or other business or personal decisions and acknowledge that professional advice should be obtained before making any such decision. 9.3. You acknowledge that some of the content may be supplied by third parties and the accuracy and completeness of it will not have been checked by BLTC. No liability shall be accepted by the BLTC for any inaccuracy or omission in the information provided on the Website or the BLTC Materials. All implied warranties are excluded from these Terms and Conditions to the extent that they may be excluded as a matter of law. 9.4. The BLTC will use reasonable endeavors to ensure that the Website and the BLTC Materials do not contain or promulgate any viruses or other malicious code. However, it is recommended that you should virus check all such materials and regularly check for the presence of viruses and other malicious code. The BLTC excludes to the fullest extent permitted by applicable laws all liability in connection with any damage or loss caused by computer viruses or other malicious code originating or contracted from the Website or the BLTC Materials. 9.5. The BLTC will not be liable for any damages (including, without limitation, damages for loss of the profits) arising in contract, tort or otherwise from your use or inability to use the Website or any content or from any action taken (or refrained from being taken) as a result of using the Website or any content of it, including in respect of infringement of third party rights arising from the your use of the content. 9.6. Links on the Website to third party websites are provided solely for your convenience. If you use these links, you leave the Website. The BLTC has not reviewed these third party websites and does not control and is not responsible for these websites or their content or availability. The BLTC therefore does not endorse or make any representations about them, or any material found on them, or any results that may be obtained from using them. If you decide to access any of the third party websites linked to the Website, you do so entirely at your own risk. Please note that BLTC gives no warranty that links to third party sites on the Website shall be marked as such. 9.7. The Website may contain links to third party websites where you may purchase items. You acknowledge that when making a purchase from a third party website you enter into a contract with that third party at your own risk and the BLTC will bear no liability for that contract. Please note that third parties may operate such shopping sites with reference to the name of the Website, but that does not mean that the BLTC is responsible for their conduct or any contracts that you enter into with them. 9.8. The Website may from time to time contain advertising and sponsorship. The BLTC is not responsible for either the content of the material provided by such advertisers and sponsors or their compliance with voluntary or statutory codes or provisions. In particular, the BLTC can provide no warranty that it will not take advertisements or sponsorship from your competitors. 10.1. If for any reason, the BLTC believes that you have not complied with any of these Terms and Conditions, it may, at its sole discretion, suspend or cancel your access to all or some of the Website immediately and without giving you any advance notice. 10.2. Without prejudice to the provisions of section 10, you agree to compensate the BLTC in respect of any claims, losses, expenses and/or liabilities (including legal fees) which arise from your use of the Website and/or the BLTC Materials (or by a third party using your user name and password) including in particular (but not limited to) any statements, contributions or other content posted on the Website. 11.1. You expressly acknowledge and agree that the BLTC shall not be liable for any direct, indirect, incidental, special, consequential or exemplary damages, including, but not limited to, damages for loss of profits, goodwill, use, data or other intangible losses (even if the BLTC has been advised of the possibility of such damages), resulting from: (i) the use or the inability to use the Website; (ii) the cost of procurement of substitute goods and services resulting from any goods, data, information or services purchased or obtained or messages received or transactions entered into through or from the Website; (iii) unauthorized access to, or alteration of, your transmissions of data; (iv) statements or conduct of any third party on the Website; (v) results of the Website, any Website linked to it and any materials posted on it; or (vi) any other matter relating to the Website. 11.3 Some jurisdictions do not allow the exclusion of certain warranties or the limitation or exclusion of liability for incidental or consequential damages. Accordingly, some of the above limitations of section 11 may not apply to you. Nothing in these Terms and Conditions shall affect the statutory rights of any consumer or exclude or restrict any liability for death or personal injury arising from the negligence or fraud of the BLTC or any other liability which cannot be excluded or limited under applicable law. 12.1. All entrants to a competition must comply with any age and/or other eligibility requirements set out in the Rules. Proof of age may be required before a prize-winner can claim a prize. The eligibility of any entrant is at the sole discretion of the BLTC. 12.3. All entries must be made in accordance with the Rules and must be received by the BLTC by the closing date. Entries made otherwise shall be invalid. The BLTC accepts no responsibility or liability for any lost, damaged or incomplete entries and all such entries will be deemed invalid. Proof of dispatch shall not be proof of entry. 12.8. Prize-winners will be notified in writing within 6 weeks of the applicable closing date (or such other timeframe as is indicated on the Website). If a prize-winner fails to respond to claim his/her prize within 14 days of receipt of the notification, the BLTC shall be entitled to select an alternative prize-winner. In such circumstances, the BLTC shall use reasonable endeavors to notify the alternative prize-winner within nine weeks of the closing date (or such other timeframe as is indicated on the Website). 12.9. Competitions are open to all persons, except employees of the BLTC, the promoter and their immediate families, the promoter’s advertising agency and sales promotion consultancy, and anyone else connected with the creation and administration of the competition. 12.10. The BLTC's decision is final and no correspondence will be entered into. Odds of winning depend on the number of eligible entries received. 12.11. The BLTC will not accept responsibility for loss through technical fault, incomplete, illegible or other damaged entries. Proof of entry is not automatically proof of receipt. 12.13. The BLTC will not be liable if a prize does not reach a prize-winner for any reason outside the control of the BLTC or if a prize is damaged during delivery. 12.18. Where relevant, all taxes, insurances, transfers, spending money and other expenses (including meals or personal expenses upgrades etc.) are, unless otherwise specifically stated, the sole responsibility of the prize-winner. 12.19. Other than for death or personal injury arising from the negligence of the BLTC, the BLTC hereby excludes (so far as is permitted by law) all liability for any loss, damage, cost, and expense, whether direct or indirect, howsoever caused in connection with any competition or any aspect of the prize. 13.1. These Terms and Conditions shall be governed by, and construed in accordance with the laws of Monaco and the courts of Monaco shall have exclusive jurisdiction to settle any dispute which may arise out of, under, or in connection with these Terms and Conditions unless BLTC shall in its sole discretion elect to bring proceedings in the courts of the country of the user's residence or principal place of business. 13.2. These Terms and Conditions (including the specific terms applicable to certain services), as varied by the BLTC from time to time, form the entire understanding between us. Headings in these Terms and Conditions are for convenience only and will have no legal meaning or effect. 13.3. No delay or indulgence by the BLTC in enforcing the provisions of these Terms and Conditions shall affect the BLTC’s rights under them, nor shall any waiver of the BLTC’s rights operate as a waiver of any subsequent breach. 13.4. No right, power or remedy conferred upon or reserved for the BLTC is exclusive of any other right, power or remedy available to the BLTC provided either under these Terms and Conditions or as a matter of law and each such right, power or remedy shall be cumulative. 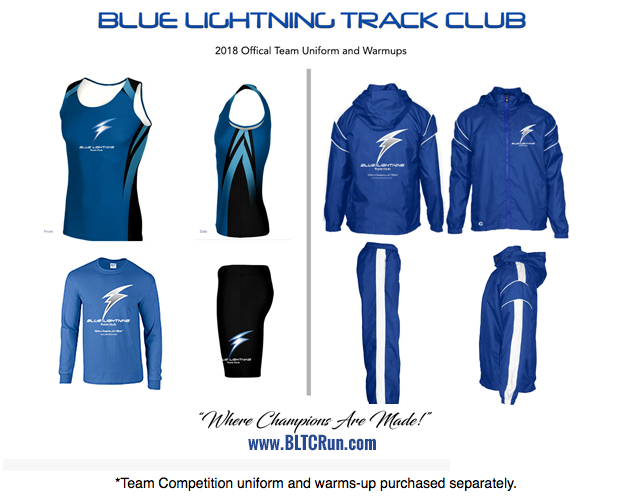 Refund Policy - Through the Blue Lightning Track Club Membership the athlete and parent/legal guardian include receiving valuable information, coaching, training, workouts, team group communications, team meetings, website resources, intellectual property, and time from our coaching staff that cannot be recovered or returned. The athlete and parent/guardian have the benefit of the experience and knowledge forever. This benefit cannot be erased or taken back by the Blue Lightning Track Club, for this reason, all monies paid are non-refundable under any circumstances.